Bobby Carroll has only a few weeks to keep the campus at the University of Massachusetts Boston clean until his layoff date. Last fall, J. Keith Motley kicked off what would become his final year as chancellor of University of Massachusetts Boston with a speech that recognized several employees for exemplary service. He saved one recognition for last. Motley asked the students and staff to give a standing ovation to one special janitor who, with a gracious attitude and a broom, tirelessly keeps the plaza clean. Even before Motley said the man’s name, everyone knew whom he was talking about. But Carroll likely won’t be sweeping or shoveling much longer. Just a year after he was recognized as exemplary, he is one of 44 employees set to be laid off in January as part of administrators’ plan to balance a budget that is in trouble after years of what auditors have called financial mismanagement and lax oversight. Carroll, who will turn 63 on Christmas Day, makes $51,000 and has worked for the school 30 years. In two years, he would be eligible to retire with maximum benefits, 80 percent of his annual salary plus health insurance that helps cover the medicine he takes to tackle his mental illness. Leaving now means he will get just 66 percent. Carroll isn’t sure how this happened, why he was chosen as one of the people to let go. He is trying to figure out a plan but in the meantime, he keeps sweeping. “I want to work, you know?” Carroll said. He was out on the plaza Thursday morning in a blue puffy coat and a hand-knit orange scarf. It was a gift, but he couldn’t remember who gave it to him. This is the end of fall, so Carroll has downgraded from a rake to a long broom to tackle stragglers that blow under the Science Center overhang. He has honed a sweeping technique over the years. First he sweeps in one direction, then from the other, tapping the broom between strokes to shake off clinging debris. When he has amassed a long pile, he pinches it, bit by bit, between a smaller broom and dustbin and tosses it into the trash can he rolls behind him. “ ’Sup, Bob?” called a man who passed him on the cracked concrete plaza. “Hi,” Carroll said, voice muffled by the wind that whips between the imposing brick buildings. Then back to work. News of his impending layoff has rocketed around the UMass campus in distraught e-mails, texts, and Facebook posts. “I cried,” said Catherine Hart, a nursing student. 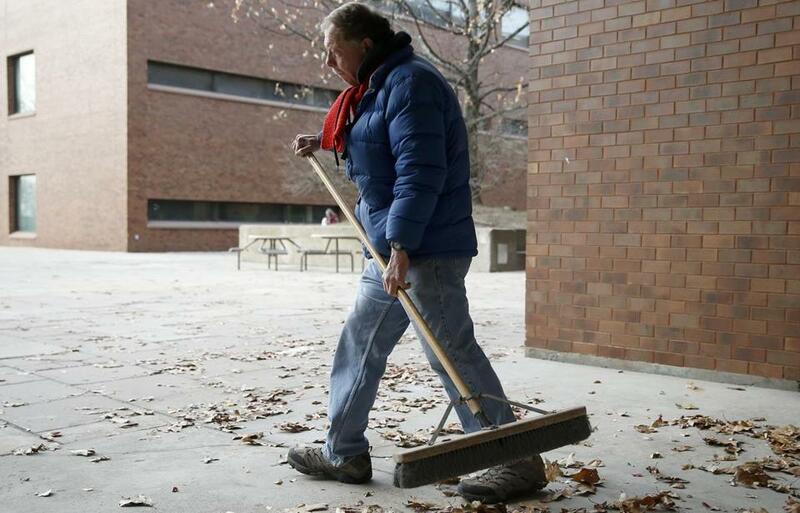 Everyone has a story about Carroll, or “Sweeper Bob” as some call him. Susan Daudelin, who has worked at the school for 10 years, said hello for weeks with no response. “Then he started saying ‘hi’ back, and I was psyched. I was glad that we were colleagues,” she said. The wind was especially strong on Thursday, and a gust struck just as Carroll had gathered a pile. Without a word, he chased down every rogue leaf. Just before noon, a colleague motioned that it was time to stop for lunch. That day Carroll said he had brought hake, a white fish, that he had cooked with broccoli, carrots, onions, and fresh garlic. He likes to stay healthy. Carroll shops for food on Fridays after work — fish from Haymarket, groceries from the Whole Foods at Symphony or in Central Square. He’s been going to Haymarket for 40 years. His shift at UMass is 7 a.m. to 3:30 p.m. In the morning he walks 25 minutes from his home in South Boston, where he lives alone, to the JFK/UMass Red Line station to take the shuttle to campus. In the evening he walks home, he said, for exercise. His job is set to end Jan. 13. He has a few ideas, such as learning tai chi or working part time at Whole Foods, but he isn’t sure what to do. He knows it would take years in a new job to earn what he makes now. Union rules allow Carroll to “bump” another employee out of his job because he has seniority. He said he might do that but doesn’t want that person to lose his job either. And he is worried for the employees who won’t be laid off. “It’s double suffering, the people who have to go and the people who have to stay, because they have to do more work,” he said. A university spokesman would not comment directly on Carroll’s layoff. The spokesman, DeWayne Lehman, said in a statement that “decisions around staff reductions are always difficult and painful.” The university has tried to ease the employees’ situation by offering three months’ notice, severance agreements, and job-search help, the statement said. UMass Boston has a center on campus that helps people with disabilities succeed in society. The director for the Institute for Community Inclusion, former state representative Tom Sannicandro, who was recently hired to run the center and makes $165,000, did not return a call for comment on this story. Carroll has worked at UMass Boston since 1987, hired thanks to a letter his aunt wrote to Joseph Moakley, the former congressman who grew up with the Carrolls in South Boston. For a while Carroll worked as a janitor inside. But when he was almost laid off once before, he said, someone started a petition and instead he was transferred to the facilities department. Before he tackled the leaves in front of the Science Center on Thursday morning, he had been at University Hall to sweep up cigarette butts. “You do your best or it’s your death,” he said. Carroll still remembers that speech that Motley gave a year ago and the standing ovation. He can quote the line about the snow and the ice shivering. That is what makes this all the more puzzling to him. “You give your best every day and that’s the reward you get?” Carroll said Thursday as he swept.